Famous tech companies both domestically and abroad are clamoring to create open and creative office environments for their employees, believing that having an enjoyable working environment is a crucial factor in becoming a world-class company. Giant Web portal Naver moved its headquarters to Bundang, Gyeonggi Province in 2010. The Naver headquarters, nicknamed the Green Factory, is 27 stories high with eight additional underground floors. The company’s iconic green search bar design was incorporated into the building’s design to promote its brand image. Naver garnered much public attention by providing pricey office furniture -- Aeron chairs from Herman Miller and Tolomeo Tavolo mini desk lamps from Artemide -- to provide physical comfort for their employees, who often suffer from eye and back strain from sitting in front of computer screens for extended periods. 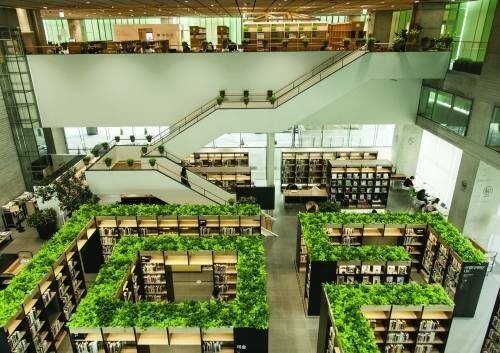 Naver’s headquarters also has a Green Library on the first and second floors that is open to the public, and the entire fourth floor is a cafe for employees to hold meetings and take coffee breaks. Bicycle parking spaces are also provided for employees who commute by bike, as well as a separate teeth-brushing room for those who feel uncomfortable using the company bathroom to brush their teeth. Korea’s second-biggest search engine company, Daum Kakao, has its headquarters on Jejudo Island. 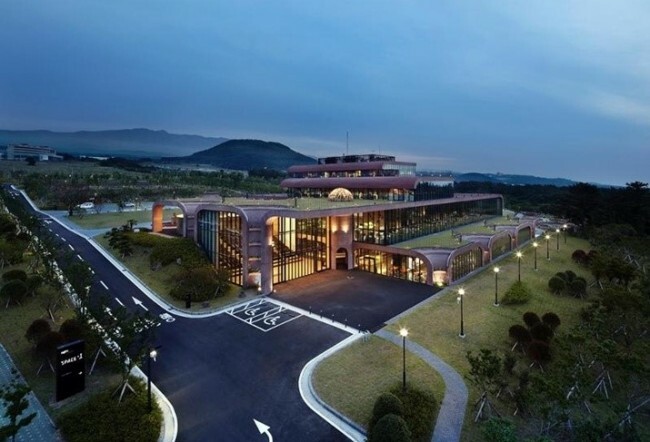 Daum Kakao opened its headquarters in Yeongpyeong-dong, Jeju City, in 2012 with a total area of 125,619 square meters. The main office building, named “Space.1,” has a curved design meant to resemble Jejudo Island’s caves and volcanoes and is five stories high with one basement level. The headquarters first began as a project to create a “creative office space” in 2004 and was built to value openness and communication within the company. The interior has no pillars and is supported by the walls, making it easier for employees to communicate while working. The building also has a game room with billiards and table tennis, as well as a library. The second building, “Space.2,” has company-owned day care center “Space.kids” for employees’ children, as well as guesthouse “Space.house.” The building has themed meeting rooms – based on a boxing ring, bathhouse and a prison cell and others -- to boost creativity. The building complex won the Korea Institute of Architects award in 2012. Samsung Electronics is building its North American headquarters in Silicon Valley. The headquarters will house the firm’s U.S. device solution team, as well as the sales and marketing team. 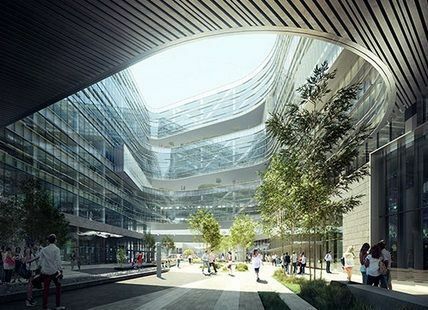 Covering about 100,000 square meters and costing $300 million, the new Samsung headquarters in the United States will be a 10-story donut-shaped building designed by global architecture firm NBBJ. The new headquarters is expected to have semiconductor research facilities, as well as a fitness center and break room. Construction is about 85 percent complete. Google’s headquarters, called the Googleplex, is famous for its open and flexible space. The Googleplex has an open space not divided by cubicles, and also features outdoor tables and a walking trail. The Googleplex houses a restaurant, gym, massage room, indoor pool and a game room, making the place a so-called “heaven for employees.” Google believes that the free atmosphere in the office space allows for increased cooperation and teamwork. Google is currently building a new office building near the Googleplex, expected to be partially completed by 2020. The exterior of the new building is expected be glass and the interior easily adjusted like building blocks to allow room for new projects such as driverless cars. Apple’s current headquarters, called Apple Campus, was built in 1993 and is a seemingly ordinary office building. The late Steve Jobs suggested building a second Apple Campus in 2011 that would better fit their image of a creative IT company. 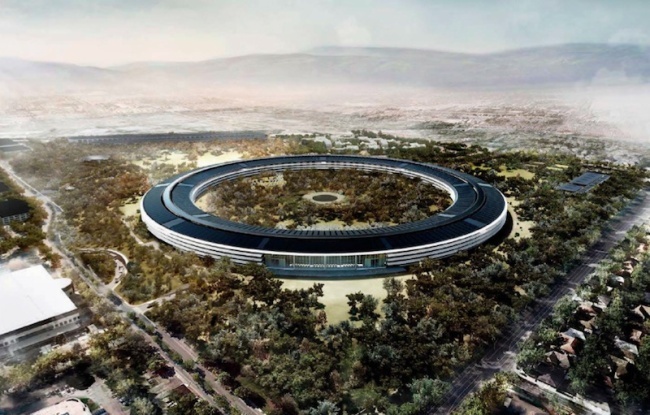 The second Apple Campus, due for completion in 2016, will be shaped like a donut with an indoor garden space that is bigger than a soccer stadium. Apple Campus 2 is built with communication between employees as its priority, as the donut shape will allow them to meet everyone as they walk about. 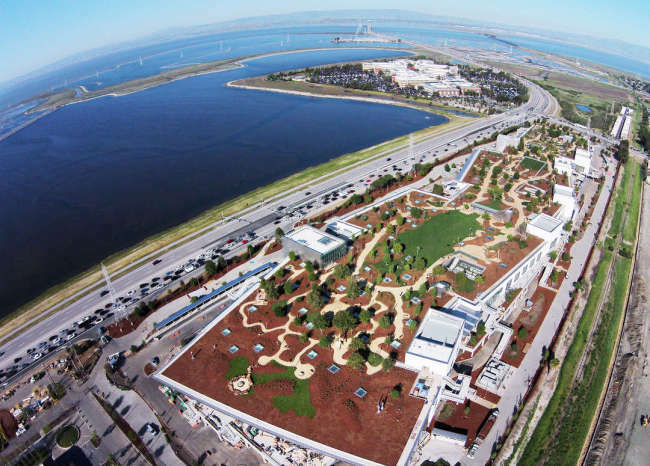 Facebook moved to its new headquarters in Menlo Park in March. The new building has no cubicles and has a completely open space inside, allowing the 2,800 employees to freely share their ideas in the 40,000-square-meter office space. The rooftop also has an outdoor garden with over 400 trees. Zuckerberg said in a media interview that he wanted the new headquarters to have a simple design in order to make an office space where the Facebook team could work together in harmony.